Before you know it, the holidays will be upon us. If you love to have people over and want to do something a little different this year, consider these options for an amazing holiday party. Have a themed party. Caterers in Cleveland believe that incorporating a theme is a great way to coordinate all of your dishes and decorations. If you love chocolate, then a dessert themed party might be for you. If you want to celebrate family, then incorporating family traditions and treats might be the way to go. Explore your heritage. Discovering a little more about your family’s history is an intriguing way to add a little spice to your party. For instance, if you have recently discovered that part of your family hails from Great Britain, then making Yorkshire pudding would add a great conversation piece to your party. Elegant appetizers. Instead of serving an entire dinner, which can be challenging to coordinate, caterers in Akron suggest making a bunch of different types of appetizers for people to share. The benefit to an appetizer party is that people have a chance to mingle more easily than a sit down dinner, allowing guests who don’t know each other well to get to know more people. Trim-a-tree party. For families, having a trim-a-tree party is a lovely way to share a Christmas tradition. Cocoa, hot coffee and sweets are the best way to give your guests something to nibble on while they are hanging lights and ornaments. After outdoor fun. If you and your family have been skiing or ice skating, then a hot, easy-to-do dinner is the right menu for the day. White chicken chili and homemade cornbread, enchiladas or even a pasta dinner can be a warm, satisfying meal in the cold. 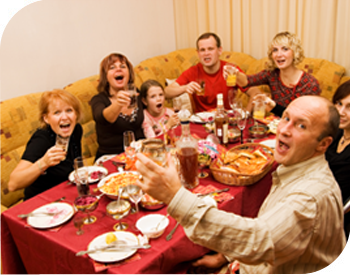 The holidays are filled with opportunities to get together with family and friends for fun. No matter what type of holiday party you are hosting, these tips will help you to create memories and fun for the people you love.